"...This is Mayor Hernandez of Farmingdale...*zzt*... Is anyone...out there? Can anyone...? Refugees...pouring into...town...*zzzt*...villages overrun...St Thomas is burning..the nuclear plant...*zt* abandoned...Walking dead...everywhere,,,.eating us! Do you hear me? *kzzt* It's the dead...attacking us! Hordes..."
"Trying, sir! Reception is awful in these mountains..."
"...hear us?...This...Mayor Hernandez...barricading town. Can't last*bzzz*,,longer...God's sake...help us! Zeds are....! *zzzzzzt*"
"Then get these trucks moving faster! We've got to get to Farmingdale before the Zeds do!" 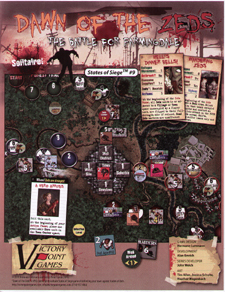 Like a deathly hand from the grave comes Dawn of the Zeds, a State of Siege solitaire game of horror and survival from designer Hermann Luttmann. The world has gone crazy - a deadly virus has turned ordinary people into vicious, zombie-like killers. These undead, called "Zeds," are now converging on your corner of the world! You have been left to yor own devices to stop them and preserve your community while the National Guard organizes a relief column to fight its way to you - but that could take days, or even weeks, before they arrive. You must lead your besieged neighbours! Regular citizens can emerge as heroes as you work to halt the Zeds' advances by (re)-killing them, discovering and implementing a cure to this vile scourge, and preserving the area and its inhabitants as much as possible. In a game that requires the utmost test of skill and nerve, will you survive long enough? Will you be able to fight hordes of Zeds while protecting the townspeople? Unearth the possibilities with Dawn of the Zeds, a nightmare that ends with your fate ranging between being a hero or a hero sandwich.